The challenge is the same for each of us. We do our research. We document our source material. We have the facts surrounding the points we want to make in our presentation. The problem is that this is all very complicated. Our research is complicated, our source material is complicated and the facts are complicated. The challenge is how to make the intellectual material into a presentation that impacts the audience to whom we are presenting. This is exactly the situation I was presented with while coaching my TEDx speaker last year. He is brilliant and his research is intriguing and compelling, but - you guessed it - complicated! We needed to take his PhD-level research (and the associated terminology and diagrams) and craft it into a presentation for a general audience. Rather than trying to just take what he had and change the wording, we started with that familiar question, “what’s in it for the audience?” What are they feeling, thinking and doing now and what do we want them to be feeling, thinking and doing after they hear the presentation? What is the compelling message of this talk? Once we figure that out, then there are two important pieces that need to be reworked: the verbal and the visual. First, the words: How are we going to say what needs to be conveyed in language that someone without his research background can understand? What examples from everyday life can we use to make a weighty, scientific, research-based point to an average person? The first main point involves showing how much sugar is unknowingly consumed in common foods. We used fat-free yogurt that many people think is a fantastic, healthy breakfast choice to show that it has 2-3 times the recommended daily intake of sugar! Which means if they eat this for breakfast, then they are in trouble before the day is barely started. Shocker for them! Next, the picture: Everyone knows about food labels, so highlighting the information on a real picture of a fat-free yogurt label is familiar, easy to understand and supports the point. Yes, some really great research diagrams are rendered unusable in this process. We used this same strategy throughout the presentation to both inform the audience and keep them engaged. In the end, the TEDx talk was a big hit and people were lined up to ask the researcher/presenter questions after his talk. More importantly, we noticed that a number of people chose not to reach for the cookie during lunch time. The audience not only understood the information, but they were keen to apply it to benefit their lives. You can employ the same process to help you take data-laden, research-heavy, intellectual information and reformat it and target it to make an even bigger impact on your audience. 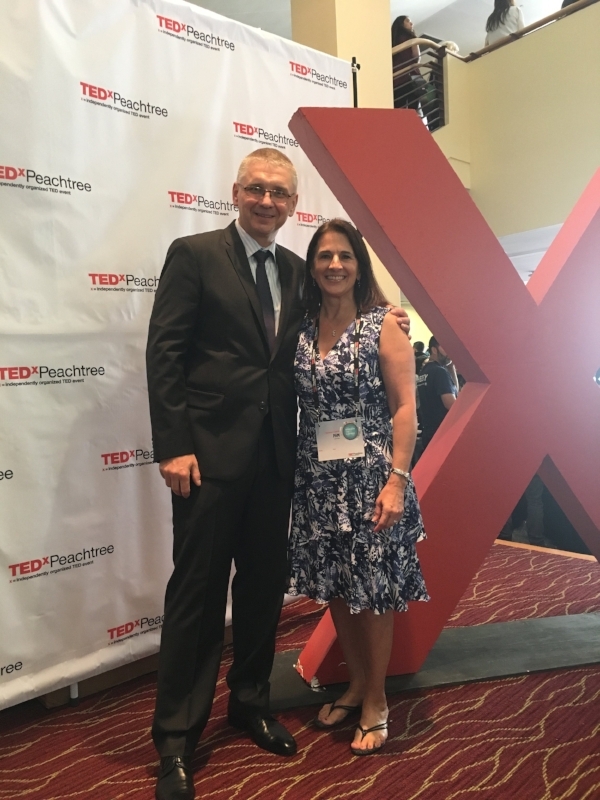 Pam and Krzysztof Czaja at TEDxPeachtree 2017.